We are a welcoming and inclusive community of people from diverse places and backgrounds. We are children, young adults, and older people. We are gay and straight, single and married, with children and without, college students, retired, or in the prime of our careers. We are African-American, Caucasian-American, Asian-American, Hispanic-American. Some of us were born in this country, and some of us were born in countries across the world. We come from a variety of different churches, or perhaps no church at all before we found St. George’s. This is a quirky and wonderful community of faithful people who enjoy each other’s company and who have chosen to journey together at this point in our lives. 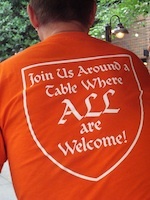 When we say, “Join us around a table where ALL are welcome,” we mean it. We believe in welcoming everyone, and in empowering our young people as full members of the parish. Our worship service reflects that belief. Our music comes from many sources, so that on any Sunday you might hear guitar music that any Roman Catholic would recognize, followed by a piano-accompanied hymn that every lifelong Episcopalian knows instantly. A hymn in the Taizé tradition might follow an Afro-American spiritual. There might be a teenager reading one lesson, a native of Sierra Leone reading the second lesson, and a member of the choir reading the third. There may be children handing out instruments to other kids and adults, making a joyful noise for the final hymn of Sunday morning’s worship. We join together to celebrate the presence of Jesus in our lives and to worship God in the rhythms and traditions of the Episcopal Church. We are part of the Episcopal Diocese of Washington and are led by the Rt. Rev. Mariann Edgar Budde, our bishop. Come and experience this place St. George’s for yourself. Come worship with us. Come and see.